At Celtic & Co we are experienced in the craft of sourcing and manufacturing luxurious footwear, clothing and homeware from the finest natural materials, ensuring that each product in our collection has the best possible impact upon our customers and the environment alike. Around 75% of our suppliers are British based, with the remainder sourced as close to home as possible from experts in their trade. By keeping our supply chain as local as possible, we reduce our environmental impact whilst supporting local industries, allowing us to ensure that all of our suppliers maintain the highest working standards. 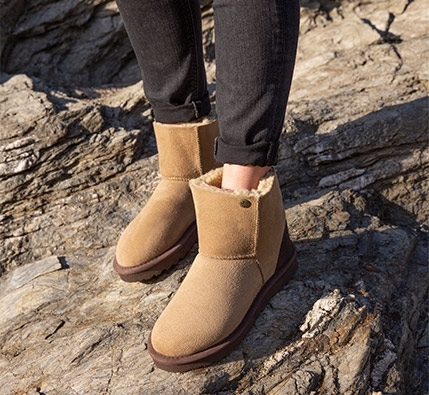 - Handmade in Newquay, all of our shearling boots and slippers are crafted by hand in our factory in Cornwall. - We proudly support British farmers, transforming what would otherwise be considered waste into sustainable footwear. - We're the only ones still doing it by hand here in Great Britain using 100% premium British shearling, with a very small proportion coming from Europe for our trims. - Our shearling is treated so you can wash most styles. - Constructed from up to 11 elements, all our shearling footwear is double-stitched for exceptional durability. - All our soles are hand cut from rubber so they're flexible, shock-absorbing and extremely long lasting. - We are experts in our field, having manufactured from natural fibres for 3 decades. - Where possible our suppliers are based in the UK and we prefer to source as close to home as possible to both support British manufacturing and ensure minimum environmental impact. - We are always striving to give our customers superb products made from luxury natural yarns and fabrics, which offer excellent value for money. - By working with other specialist producers we can utilise their expertise and years of knowledge to provide our customer with top quality products, designed to last a lifetime. Sign up for the latest news, offers and ideas. We'll send you our New Season Catalogue in the post.